I can’t believe i’m just 2 weeks away!!! It’s crazy! So far no contractions yet, but I have been getting a little cramping which the doctor says it could be because my body is getting ready. I’ve gained a total of 34.5 pounds so far (164.5) I weighed in at the doctor this morning. The newest body morph is the pain in my hands, but mostly my left hand, it almost feels like arthritis (not that I know what that feels like, but i’m taking a guess) which I guess is common too? Trying to drink as much water as I can, which is making me pee almost 12 times a day!! ugh! The baby is in head down position which is good and the baby room is finally ready! woo hoo! The biggest shock to me, which happened last week is how everyone treats you like you can go into labor any minute…it’s just crazy to think…but I guess i’m at the stage where I could! I did have an interesting experience at the doctor last week, they talked about “stripping my membrane” which in my 7 birthing/labor care classes NO ONE MENTIONED! Apparently it’s a way to induce labor naturally? I had not heard of it and i’m still debating about getting it done? 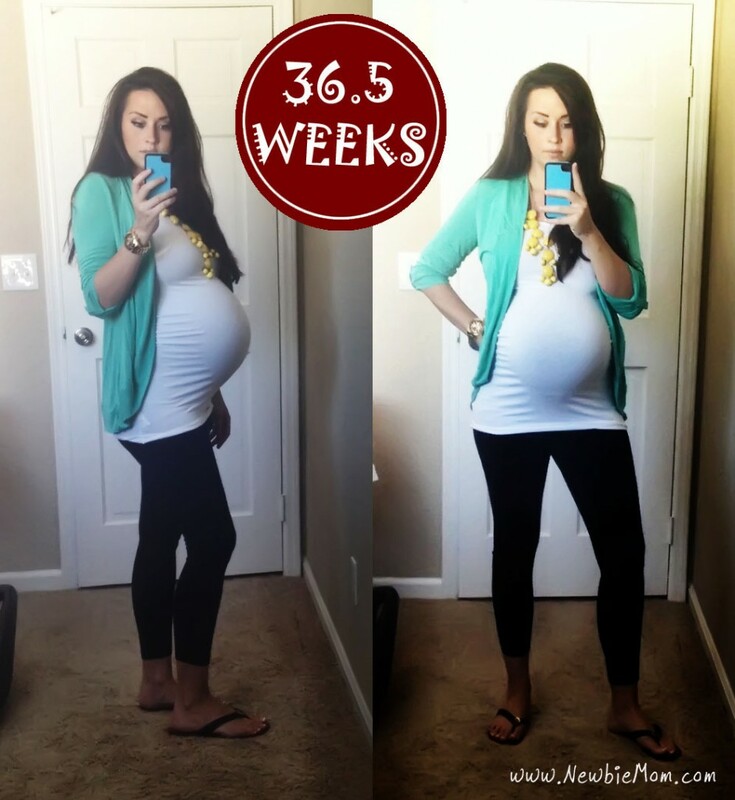 maybe at 40 weeks? Going to a concert 8 and half months preggo! Some serious nesting going on…. 14) breast pads, for the leaking…. Have I forgot anything? 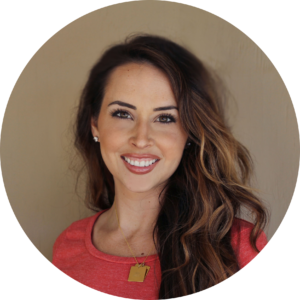 I probably have…what did you need ready right when you got home with your newborn? I remember telling my cousin at telling me at 28 weeks how big I thought I was and she would tell me….”oh just wait….” I didn’t really understand then…but I’m starting to get it now. Just when you think your belly couldn’t possibly get any bigger IT DOES. And here’s the thing, I get it, I look like i’m going to pop, my belly button is out at full attention, I waddle around like a little duck but please stop telling me “wow! you look like you are going to POP!”. I literally hear that exact phrase about 15 times a day…and I’m not really sure how to respond? So if you can come up with any clever comebacks I am ALL hears. Some of you may not have seen this video collab I did with Elle at “what’s up moms” this amazing youtube channel, but if you haven’t please check it out! 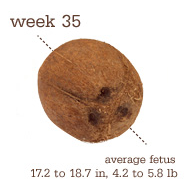 Your baby is the size of a coconut its’s about 17.2 to 18.7 inches long and weighs about 4.2 to 5.8 pounds this month. So I originally thought I my belly button couldn’t get to be more of an “outie”….boy I was wrong, it’s at full attention now. We took our labor and delivery class last week and it was amazing! It was an 8 hour class (even though I told my husband it was only 4 hours…that’s a pretty funny story) and I feel SOOOO much better about giving birth. They walked us through all the stages of labor, which I had no idea about. I thought your water broke and you popped out a baby. Cravings are pretty much the same though I don’t eat as many eggs as I used to. And the new addtion to the cravings are fruit snacks and fruit roll ups…yum! 1) Do not go into the ER entrance this might not be for everyone, but the hospital i’m giving birth at has it’s own seperate entrance so you don’t come into contact with any sick people…which is a great thing! 2) Don’t come to the hospital unless your contractions are 5 minutes apart 1 minute each lasting for 1 hour…you would need to go sooner if…your water breaks, you are bleeding, rectal pressure, or if you can NOT talk through your contraction. If you start to experience contractions it might just be because your dehydrated, so they recommend to try and make the contractions go away on their own by drinking a glass of water and relaxing. Alot of couples come to the hospital when the contractions just start and they will most likely be sent home or be laboring for hours, when you can just labor at home for a bit. 4) The real purpose of breathing techniques…is primarily to get your mind off what is going on and so you don’t hyperventilate. The rhythm of the breathing is a great way to stay focused. As well as focusing on a object to get you through the contraction. 5) If you can try not to get the epidural too early. This was another one I found really interesting since I was planning on getting an epidural. They recommend waiting just incase the baby is head down BUT face up. you can try a lot of techniques to have the baby go face down if you are able to walk around and stand up. Once you get an epidural you are pretty much bedridden. We learned a ton of other things but these are the things that stand out the most!